Thirty years ago, I wrote a check for around $495 for my first semester at U.W.G.B. Can't we stop here for just a second. THIRTY years ago? WTH?! That's CRAZY! This week, Kyle paid about $7200 for his fall semester tuition at UWGB. So...when I was contacted by Campus Book Rentals and asked to check out their site, I was very interested, of course! I actually had Kyle check out the site, and he was very happy to see that he could rent his books ($250 through the UWGB bookstore), instead of buying them, for just $108 from Campus Book Rentals*. I could tell you all about the great services Campus Book Rentals (CBR) offers, but you can find those on their website. One of the things I liked a lot about CBR is the fact that they have teamed up with Operation Smile, an incredible organization that changes the lives of children with cleft palates and/or other facial deformities. They don't just change patients' lives, though; there are many powerful stories on their website from volunteers, like Jack Smith. 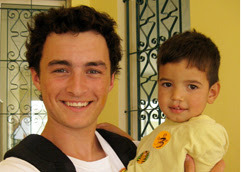 There are some seriously-heartbreaking, yet inspiring, stories on Operation Smile's video page. As a mom, I got choked up seeing each of those kids' mothers see them for the first times after their surgeries. Can you imagine if this were your sweet baby? I'm not gonna lie--looking at some of the photos on the Operation Smile website was unsettling, but can you imagine being on the receiving-end of people's reactions to facial deformities? In many, many cases, these poor kids live lives as social outcasts, living on the streets, when a simple surgery that could take less than an hour could correct their deformities. Operation Smile has provided 200,000 free surgeries to children and young adults around the globe. They have made an incredible difference in the lives of patients, as well as thousands of volunteers and medical professionals. You can't argue with the value of a program like that. *They pride themselves on their Customer Service. *Their book selection is huge. *You send your books back through a postage-paid envelope. *If you change your mind, you can return the book within 30 days for a refund, without issue. For more information, visit Campus Book Rentals and Operation Smile. *In addition to the killer savings every student gets, we received a discount coupon in exchange for my helping get the word about Campus Book Rentals' work with Operation Smile. The $108 does not include the additional coupon savings. Wow, tuition was cheap when you were in school and wow, is there really justification for the dramatic increase? And what an amazing way to help out. Renting books from a company who supports a great cause. When I was in college I bought books the first 2 years but after that I stopped buying them and would just attend every single class and look everything up online. Glad I figured out I didn't actually need to buy the books because I was in college for about 8 years. That would have been soooo expensive. Now my head is swimming because I just thought of how much I *still* owe from being in college for so long. ($12K). Thanks for the tip on Campus Book Rental! That's great that you can rent books now. My dad worked at the university I attended, so I got half tuition! Wow, I wonder if that's a program that's offered here? We have two of our daughters in University this year, and the price of books is outrageous! I need to check this out....thanks! What a terrific program! I'll defintely check it out! I have a college sophomore and freshman this year! College tuition is outrageous! So glad we don't have to send anyone to college these days!